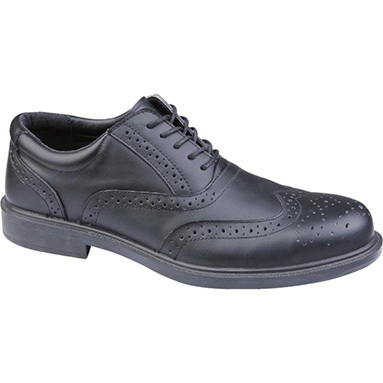 Delta Plus Richmond - Brogue Safety Shoes. High-quality smooth black leather uppers in fashionable brogue style. Padded collar for greater comfort. Polyamide lining & foam insole for softness and comfort. Mono density PU outsole, providing cushioning and ensuring abrasion resistance. Outsole studs design is certified anti-slip SRC. To EN ISO 20345 protective standard - S1 SRC.